Our week-long countdown of the best jazz releases of the year continues with #s 20-16. Let’s go! Trumpeter Wadada Leo Smith has been extremely productive in recent years, issuing single- and multi-disc sets at a furious clip. The Great Lakes Suites features maybe the closest thing to an all-star band he’s ever assembled: alto saxophonist Henry Threadgill, bassist John Lindberg, and drummer Jack DeJohnette. Its six tracks range from nine to 22 minutes, and they’ve got a vitality that belies the players’ ages; it’s a 90-minute journey of remarkable intensity. Red Hill is a very different record. It opens with a muted but still piercing melody from Smith, and slowly the rest of the band—keyboardist Jamie Saft, bassist Joe Morris, and drummer Balazs Pandi—come together behind him. 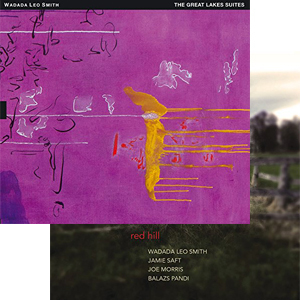 This is a moody, reverb-soaked album that feels spiritually kin to some of Bill Laswell‘s 1990s work, both with John Zorn‘s PainKiller and on his own—a unique context for Wadada Leo Smith‘s highly individualistic, instantly recognizable trumpet sound and compositional style. The fourth album by trumpeter David Weiss’s all-star septet, The Cookers, finds alto saxophonist Craig Handy replaced by Donald Harrison, but the rest of the lineup remains stable: trumpeters Weiss and Eddie Henderson, tenor saxophonist Billy Harper, pianist George Cables, bassist Cecil McBee, and drummer Billy Hart. With four horns up front, the melodies can feel fanfare-ish, and blare a little, but each soloist’s voice is unique, though they all tend toward fleet and flashy runs rather than deep blues explorations. Cables, McBee and particularly Hart make a fantastic rhythm section; the drums are sharp and cracking, with a hi-hat that snaps shut like a trap. 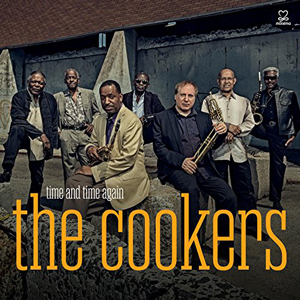 The Cookers fascinate because they’re not mimicking 1960s hard bop—instead, they’re making music that recalls mainstream jazz of the mid-70s in its melodies and its production, and even brings to mind Steely Dan at times. It’s a unique sound, and they haven’t made a bad record yet. Tenor saxophonist Michael Blake, pianist Frank Kimbrough, bassist Ben Allison, and drummer Rudy Royston have made an album inspired by Coleman Hawkins and Lester Young but entirely composed of originals. The band lays hummable melodies atop stocky, swinging grooves, kicking off with the loping, baggy-pants blues of “Skinny Dip.” The nearly 10-minute “Letters in Disguise” begins atmospherically, before developing into a tender ballad that gradually shifts into a higher gear. Similarly, “A Good Day for Pres” moves through several distinct stages, but stays coherent. 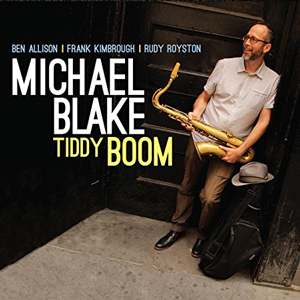 Tiddy Boom has the feel, and sound, of a mid ’50s blowing session on Prestige or Riverside, Blake’s huge tone flowing through the fullest portion of the tenor’s range, sounding almost like a baritone at times. There’s plenty of modernity amid the classicism, of course. Nobody’s trying to pretend it’s not 2014. But overall, Tiddy Boom pays bluesy homage to traditional jazz virtues while keeping an eye on the horizon. Saxophonist Sonny Simmons made his debut as a leader in 1966, with the ESP-Disk release Staying On the Watch, and his relentlessly exploratory spirit has earned him a five-decade career. On Nomadic, he’s backed by Moksha Samnyasin, a trio featuring sitarist Michel Kristof, bassist Thomas Bellier, and drummer Sébastien Bismuth through four lengthy, slow-crawling tracks closer to Fushitsusha, Om, or Tony Conrad and Faust’s Outside the Dream Syndicate than jazz. 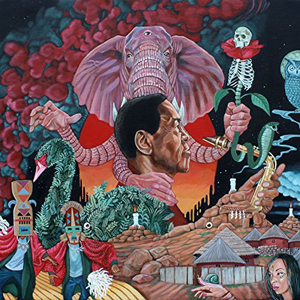 The combination of Indian instruments, reverb-heavy and electronically tinged production, and the throbbing backbeat may also recall Miles Davis tracks like “Ife” or “Yesternow.” Simmons’ saxophone lines are long, heavily reverbed ribbons of sound that float and drift atop the thick, throbbing foundation set up by his bandmates. And yet, the last sound we hear is him whooping as he takes the horn from his lips, laughs, and says, “Go get me a beer, please.” Capping off all the studio production, it’s a perfectly human moment. 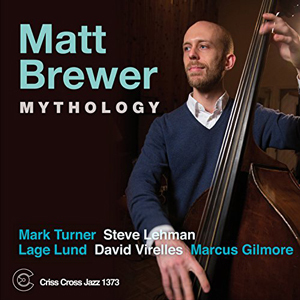 Bassist Matt Brewer made his debut as a leader with this album, calling in alto saxophonist Steve Lehman, tenor saxophonist Mark Turner, guitarist Lage Lund, pianist David Virelles, and drummer Marcus Gilmore for support. The compositions, all Brewer originals save for a version of Ornette Coleman’s “Free” (from Change of the Century), all unfold with a grounded patience, rarely getting overexcited. This could be a recipe for faceless modern post-bop tedium, but the way Lehman and Turner split up, take circuitous paths around each other, then come together again like formal dancers, keeps the whole thing fascinating. Virelles and Gilmore make superb partners for Brewer, and the pianist’s time in the spotlight is well-earned and well-spent. While Lund is one of the least interesting jazz guitarists around, he finds a way to contribute here and there. Criss Cross is so low-key about its releases, it’s easy to overlook them. This one’s worth seeking out.